Here's the problem with replacing a Honda harmonic balancer crankshaft pulley. They made the crankshaft bolt incredibly tight. Even when I used my professional grade thunder gun, the bolt wouldn't budge. If You have an air-powered impact gun you'll also need the special crankshaft bolt socket. This handy device increases the hitting power of your air-powered impact hammer. However, most of us plan on tackling this job at ground level using hand tools. As with the instance of using air tools, special equipment is available to make the job easier. 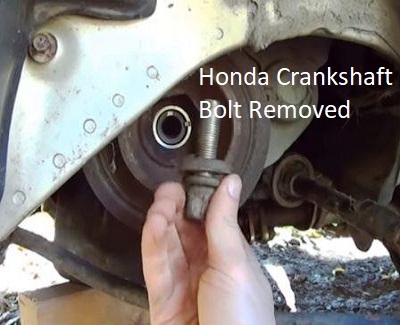 In the repair section below, we'll cover some tips and techniques that shed some light on why people struggle to break the crankshaft bolt loose. If you watch a few YouTube videos of people struggling with replacing the Honda harmonic balancer crankshaft pulley you can see the biggest obstacle is not having the right tools for the job. Just in case you don't make it down to the repair section let me cover the mistake I see most often. As I mentioned, the special tools include a holding fixture and a specialized socket to remove the bolt. Unfortunately, I see people using three-eights and half-inch drive breaker bars and extensions that are way too long. The longer the extension the less torque applied to the head of the Honda crankshaft bolt. In addition, even a 1/2 inch drive extension has too much flex for the amount of torque needed to break the bolt loose. As the extension twists and flexes it absorbs pressure meant for the crankshaft bolt. On some models you can use a short enough half inch extension and it might work. With that said, on many models you need to use a longer extension and a jack stand to steady that extension. Use three-quarter inch tools to get the bolt broken loose safely. Many parts stores will let you borrow a three-quarter inch breaker bar and extension with adapters. These tools offer increased leverage and absolutely no torque robbing flex. It will probably come as no surprise to you that when we discuss the repair procedure it's the incredibly tight crankshaft bolt that people spend most of their time on. Here's a video of the young man that grabbed the right tools for the job and made quick work of breaking loose the bolt. Note that I don't agree with his dirt floor location for performing the repairs or having unused Jack stands surrounding the car. With that said, what he got right was the length of the extension and the use of a tool with absolutely no flex. Here's how you replace a Honda harmonic balancer. Now it's finally time for some good news. When you talk about a crankshaft harmonic balancer on a Jeep or the defective crankshaft pulley on a Ford, they press these parts on at the factory. This means on Fords and Jeeps you need a a special remover and installer tool. However, the Honda harmonic balancer crankshaft pulley isn't an interference fit. In other words, this thing is not pressed on. Once you get the bolt off, a couple of wiggles or maybe a few taps with a rubber mallet and the pulley comes right off. With that said, there's a rather large key way you'll need to keep an eye on. Make sure that it either stays in place or gets reinstalled with the new part. There is no need to apply any lubrication or anti-seize compound on any of the Honda harmonic balancer crankshaft pulley parts and components. 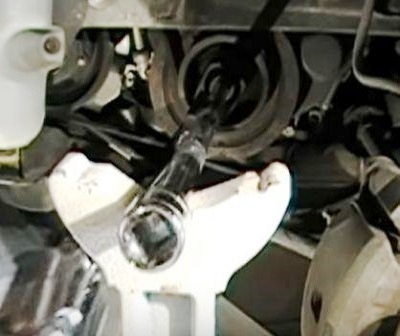 I've also seen a lot of videos where they spray the crankshaft bolt down with WD-40 before removing it. This becomes a waste of time in my opinion. The penetrating oil has no effect on the crankshaft bolt tightness and rust isn't the reason it won't come loose. When people get a close-up look of a Honda crankshaft pulley there often surprised to see a two-piece assembly. The outer ring they considered the pulley part that drives the engine belt and the associated accessories. The hub is the inner part that engages the crankshaft and the key way. There is a thick and dense rubber band of material pressed between the outer pulley and the inner hub. It's this rubber insert that's designed to absorb vibration. Unfortunately, over time the rubber begins to deteriorate. When this happens the outer pulley driving the engine belt starts to walk up and back and create quite a bit of noise and vibration. Although I have never seen one come flying off of a Honda automobile, I have seen it on a Jeep and Chevrolet product. The damage can be expensive if the heavy harmonic balancer is thrown into the radiator and automotive air conditioning parts. For this reason I recommend not putting off the repairs and taking care of the Honda harmonic balancer crankshaft pulley issue before it winds up costing you more money. We filed this article in the automotive, miscellaneous section. Also take a look at this additional information about common Honda VTEC system problems. And don't forget the home page.